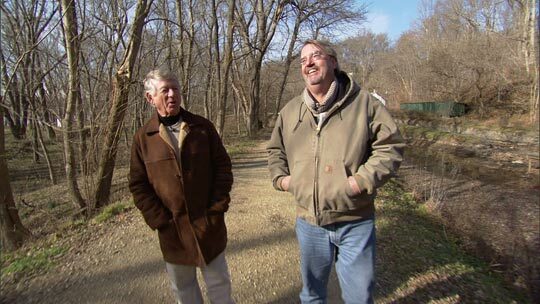 Leroy Sievers' Battle Inspired Courage Ted Koppel lived through some the most exhilarating and dangerous moments of his life and career with Leroy Sievers. Koppel remembers Sievers as a man larger than life. 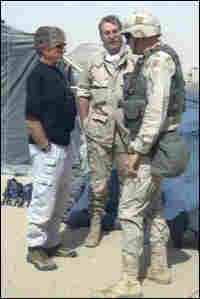 Leroy Sievers and Ted Koppel on assignment in Iraq. 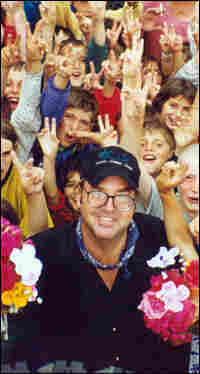 On a trip covering the Kosovo conflict with Ted Koppel, Leroy Sievers was given an unforgettable 44 birthday party. 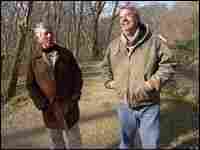 Ted Koppel (left) and Leroy Sievers walk along the C & O Canal near Washington, D.C. I'm looking at a calendar that Leroy gave my wife, Grace Anne, and me for Christmas last year. "2008," it says, and next to that is a picture of the three of us. I'm half a head taller than Grace Anne; Leroy towers a full head above me. It's inevitable, I suppose, when someone is Leroy's size that the physical presence leaves such a durable impression. Six feet 5 inches combined with an often losing effort to stay below 250 pounds. My old friend Barbara Walters provoked a lot of mockery for asking the late Katharine Hepburn what kind of a tree she would have liked to be. I never asked Leroy; but then, the question would have been irrelevant. Leroy was oak, through and through. 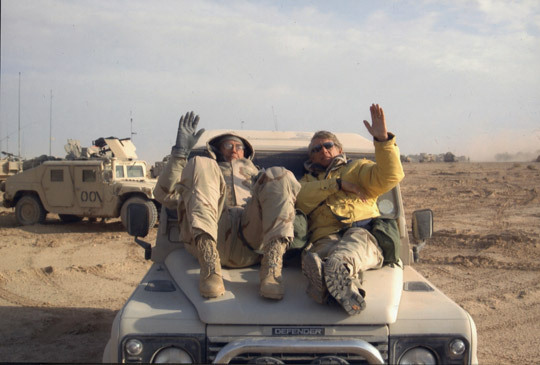 Back in March of 2003 we drove from Kuwait through southern Iraq, up into Baghdad with the 3rd Infantry Division. Leroy and I shared a Land Rover. We traveled in it, ate in it, slept in it. There was no air conditioning, and we were obliged to wear the biochemical suits that the military had issued to us. 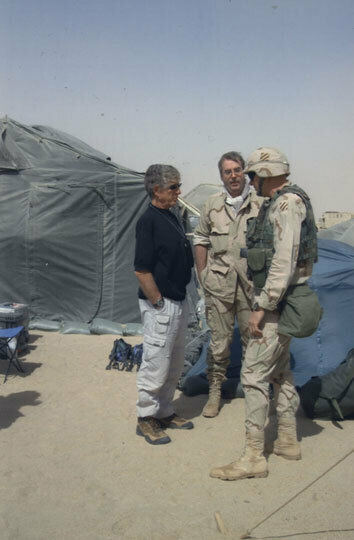 In those days, there was no doubt in our minds that Saddam Hussein's forces had biological and/or chemical weapons, and so we wore those suits 24-7 and carried our gas masks strapped to our thighs. When we drove, we kept the windows shut because of the blowing sand churned up by the 3rd ID's tanks and armored personnel carriers. I never drove through worse conditions — and never had a better traveling companion. Although, again, Leroy's size was always an issue. At night, I scrunched on the front seat, across the width of the vehicle; Leroy slept along a bench seat that ran the length of the rear seat and storage compartment. One night, Leroy stretched a little too vigorously, and out went the rear window of the Land Rover. We had spent weeks, Leroy and I, walking the towpath of the C&O Canal, carrying 40-pound backpacks; getting in shape for Iraq, for the miles that we expected to walk there. It never occurred to either of us that because the 3rd ID is an armored infantry division, nobody walks. 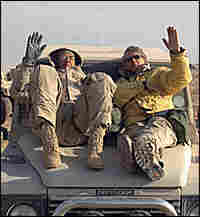 On Leroy's 44th birthday, June 16, 1999, he and I were in Kosovo. We had driven to the outskirts of Pristina, looking for a notorious prison in which the Serbian military had held political prisoners. When we found it, the prison was sparsely guarded; but the man in charge was afraid to let us in because there was a Serbian outpost directly across the road. He would do so, he told us, if we could find some NATO troops to protect his prison. Leroy and I ran back up the road where we persuaded a British sergeant, commanding an armored personnel carrier, to take up position in front of the prison while we went inside. There were only three prisoners left. "How long have you been held here?" I asked the first of them. "Nine years," he said. "What were you in for?" "Murder." The second prisoner had been in for seven years, also for murder. The third .... Leroy and I, it appeared, had just sprung three murderers from prison. All the political prisoners had been released earlier that week. Now the official in charge of the prison was terrified for his own safety. We would have to take him with us, he insisted. We agreed, on the condition that he take us to where the political prisoners were now hiding. With the exception of the British armored personnel carrier that we had positioned in front of the prison, NATO forces had not yet secured the piece of countryside we were in. We drove for a few miles and then turned up an unsurfaced country path. A few hundred yards up the path, some children appeared. On this occasion, too, we were driving a Land Rover, so the children assumed that we were part of the liberating NATO forces. They began chanting "NATO ... NATO" With each hundred yards up the path more and more people began to emerge. Finally, we pulled into a village square, where well over a thousand people were waiting for us. The villagers had been sheltering political prisoners and refugees at the rate of 30, 40, sometimes 50 to a house. And now they were free. One look at Leroy and they knew who the commander of our unit was. Somehow, word got out that it was Leroy's birthday, and within minutes people were approaching him with arms full of flowers, while others pelted our vehicle with candy. An old man kissed the spare tire on the hood of our Land Rover. 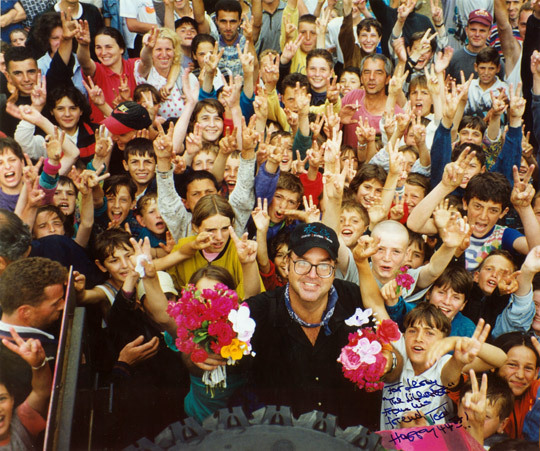 I have a picture of Leroy surrounded by the adoring multitudes, towering above them, holding his birthday flowers; happier than I have ever seen him. Leroy had worked with many other correspondents during his years at CBS News before he joined me at Nightline. It was in the nature of his work that he went to dangerous places, difficult places. He was in Panama, Honduras, Nicaragua at the worst of times. He and I often talked about it during these last few years of his battle with cancer. Each of us had considered the notion that we might die young. Too many of our colleagues have been injured or killed covering the same stories we were covering. Michael Kelly, the brilliant writer for the Atlantic Monthly, traveled with us from Kuwait to Baghdad. Michael died on the outskirts of Baghdad, leaving behind a widow and two young sons. John Lennon used to say: "Life is what happens to you while you're busy making other plans." Cancer was not in Leroy's plans. But he turned his battle with cancer into the most dramatic, the most moving and the most important story of his life. He touched so many of you who are fighting your own battles. He inspired courage; not simply by what he wrote in his blog every day, but by who he was: larger than life while he walked among us, and destined to be even larger in our memories.